World of Warcraft: Battle For Azeroth's first content patch, Tides of Vengeance, has been announced – AiPT! Blizzard has announced the first major content patch for World of Warcraft: Battle For Azeroth – Patch 8.1, Tides of Vengeance. The announcement was made on Twitch during a developer livestream via Game Director Ion Hazzikostas. Hazzikostas acknowledged The Alliance has suffered a string of setbacks, most notably the destruction of the Night Elf’s capital city, Teldrassil, which the Horde burned. Then after capturing Lordaeron, it was taken away again in an instant and the Arathi Highlands have suffered Horde incursions. Thus it’s time for The Alliance to strike back! War Campaign continues with more chapters to further the story, heavy inroads made into Horde territory. Incursions – Reminiscent of Legion assaults. Horde/Alliance will have landing forces invade a zone, which disables World Quests and adds a new objection to the area. Open to alts to help with leveling. 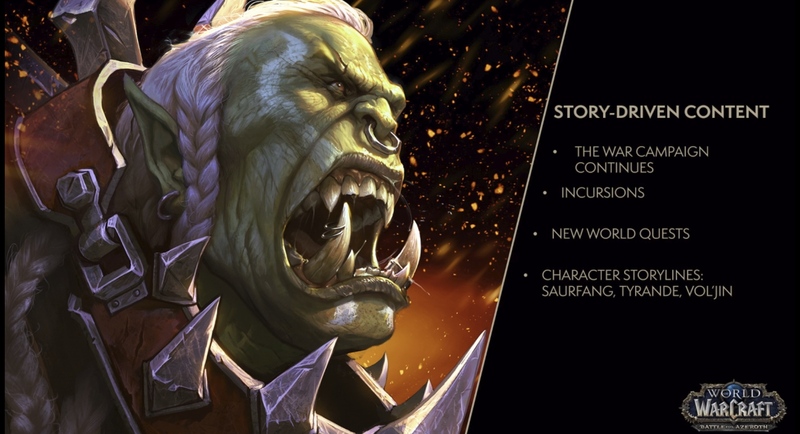 Jaina, Saurfang, Tyrande, Malfurion and Vol’jin will all have their stories expanded in the aftermath of the events of Teldrassil and Lordaeron. Dwarves and Blood Elves receiving heritage armor. No massive rep grind required. Simply be max level and have exalted reputation with your home city to unlock the quest. More races to be added in the future. New Warfront – The Battle for Darkshore. Night Elves against the Foresaken as they attempt to reclaim their ancestral home. Very heavy Warcraft III theme. Darkshore zone being updated for a max level experience with content to enjoy outside of the Warfront. Island Expeditions received a ton of feedback and Blizzard has worked hard to improve the underlying system and add as much variety as possible to ensure each island feels like a unique experience. They’ll be two new Island Expeditions added: Jorundall, Vrykul themed and Haveswood, Gilnean City theme. All Island Expeditions will be receiving new events, rare bosses, spawning improvements, hubs of mobs and objects such as the Azerite extractor, which provides you with a slow trickle of Azerite throughout the expedition (if your faction controls it). Unlike any raid before it, in that the opposing faction is the raid. Unique experience for each faction. Alliance attack Zuldazar under Jaina’s leadership, fight through the harbor, up the pyramid and confront King Rastakhan. Horde defend the city, push Alliance out of the pyramind, through the city, down to the docks and confront Jaina on the high seas. Each experience has six faction specific boss encounters. Two boss raid encounter located underneath Stormsong Valley. Uncover dark secrets, witness Azshara’s influence in a Trial of Valor type raid. Naga invasions and Naga themed World Quests will coincide with the release of the raid, to help provide context on why players are venturing there. Hazzikostas spoke to the huge amount of feedback Blizzard has received from the community, which has helped them identify reputation and Azerite traits as two areas where they want to make big improvements. To that end Blizzard is tuning existing Azerite traits and adding a slew of new ones to better balance the gear juggling players are having to do. Champions of Azeroth reputation will become account wide, regardless of whether or not you’re exalted. So your new 120 alt can go buy the Revered gear you unlocked on your main. Reputation that restricts transmog items from old content is also being removed. Achievement hunters can combine Exalted reputations across their characters to snag goals that changing mains may have made more difficult. Lastly and most importantly, there won’t be a new reputation to gain Exalted with to unlock Kul Tiran and Zandalari Allied Races. You simply need Exalted with Zandalari / Proudmoore and have played through the War Campaign. At this time there’s no word on when Tides of Vegeance will be released, but players can experience the new patch on the PTR by the end of the week.